This is one of my first publications about the characteristics of a High Performance Organization. For more recent publications visit the Knowledge & Inspiration page! 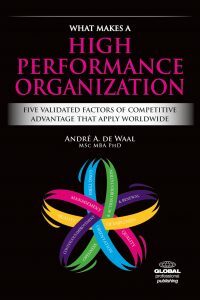 Ever since the publication of Peters and Waterman’s landmark study In Search Of Excellence (1982) and the bestsellers Built To Last and Good to Great of Collins (1997, 2001), there has been a strong interest in identifying the characteristics of a high performance organizations (HPOs). This interest has been fired by the rapid changes in the competitive environment of companies and the pressure of ever increasing demands of the external environment and stakeholders. By identifying the characteristics of a high performance organizations, organizations hope to be able to improve themselves in a focus way so they can start achieving sustainable performance. This article describes the results of a meta analysis of 91 studies into high performance organizations (performed since 1992). The analysis yielded characteristics with regard to the organizational design, structure, processes, technology, leadership, people, and culture, and the external environment which seem to influence the ability of organizations to achieve high performance. These characteristics of a high performance organizations can guide managers as to which actions they need to take to lead their organizations to superior results. Purpose: To identify the characteristics of a high performance organization (HPO) so managers can start improving their organizations in such a way that these also become HPOs. Design/methodology/approach: The research is based on a meta analysis of the results of 91 HPO studies performed in the last and present decade. Findings: The results of the analysis offer a first picture of what a modern HPO looks like and provides the characteristics managers need to focus on in order to turn their companies into HPOs. Research limitations/implications Despite an extensive literature search, potentially valuable studies might have been missed. Also, the studies look by definition at what organizations have done in the past, therefore not necessarily giving a guarantee that these characteristics will also be valid and of importance for the dynamic future. Further HPO research should focus on validating the characteristics found in this study so management can start improving with confidence their organizations. Also, additional research should aim to validate the link between the HPO characteristics and organizational performance, in order to make sure it is worthwhile for companies to improve themselves in the direction indicated in this article. Practical implications: As it is the task of every manager to realize the goals of the organization by achieving outstanding performance in the organizational unit he or she is responsible for, managers are under great pressure to deal effectively with trends and developments. Therefore, more is know about the elements which make up sustainable organizational performance, the easier is becomes for managers to improve their organizations in a focused way. Originality/value: The results of the search for the characteristics of a high performance organizations have been documented mainly in the popular management literature, scientific research into HPOs until now has not been abundant. Therefore most evidence is anecdotic from nature, consisting of surveys and case studies. The research described in this article forms the start of a thorough investigation of HPO characteristics which is executed in a scientific way while at the same time yielding practical results with which managers can start improving their organizations. In the wake of Peters and Waterman’s landmark study In Search Of Excellence (1982) and the bestsellers Built To Last (Collins and Porras, 1997) and Good to Great (Collins, 2001), there has been a strong interest in identifying the characteristics of a high performance organizations (HPOs). This interest has been fired by the rapid changes in the competitive environment of companies (Laudicina, 2005), forcing them to “adapt faster and faster to growing international demands for flexibility and speed and to compete simultaneously on the basis of development cycle time, price, quality, flexibility, fast and reliable delivery, and after-sales support for their products” (Kasarda and Rondinelli, 1998). As a result of the changes in industry and society, governmental agencies too are subject to changes. They have to rapidly reshape themselves into nimble and flexible organizations which put the interests of citizens central, a movement which is known as New Public Management (Zeppou and Sotirakou, 2002; Pollitt, 2003). This article describes the results of a meta analysis of HPO studies that have been published the past fifteen years in the literature. From the analysis several characteristics of a high performance organizations appear that seem to be decisive factors for achieving lasting good performance. Read the full article ‘The Characteristics of a High Performance Organization’ published in Business Strategy Series in PDF.